"...it has given me part of my life back, and it only took about 2 minutes." Need more than just a bottle or two? 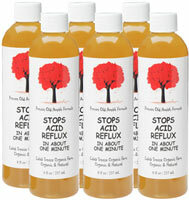 All individual bottles, Twin-Packs and 6 Packs of Stops Acid Reflux are shipped via USPS Priority Mail only. No UPS or Air Freight. We ship Priority Mail to any address or P.O. Box in the contiguous United States, Hawaii, Alaska or Puerto Rico. 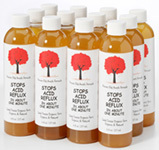 Bottles are shrink wrapped for tamper proof protection and stamped with a product expiration date. *California residents must pay 9.25% sales tax. credit card using our secure shopping cart, click here. For Canadian orders, CLICK HERE.